plusSound provided the X8 free of charge for the purpose of my honest review, for good or ill. The X8 Silver + Gold sells for $724.99. plusSound has come a long way in my estimation. They’ve always built quality products that sound great. But their bigger, heavier cables were difficult for me to use. You can see my experience with the X6 Tri-Metal was less than ideal. They’ve worked hard to rectify that. When I tested their new insolation sheathing on a four-strand Exo model, I was impressed by its suppleness, and found myself eager to see if this translated to their fatboy X8 models. 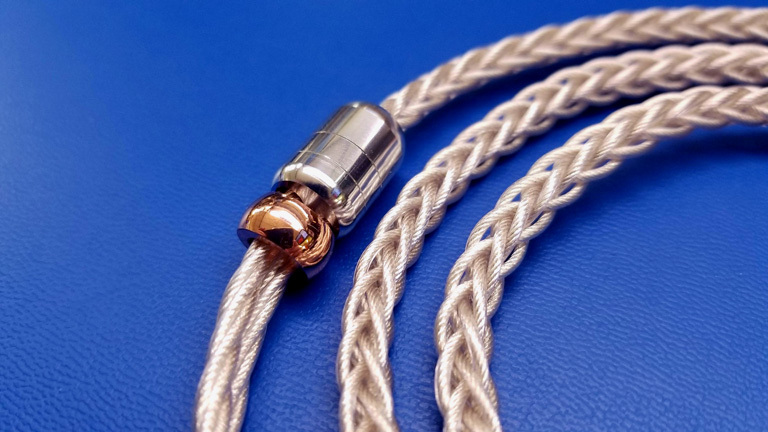 I had just reviewed an 8-strand pure silver cable from Effect Audio, and asked Christen at plusSound if he had something he’d like to see compete against it. He sent the X8 Silver + Gold. The Silver/Gold alloy has an almost pearlescent quality. The hue declares the mixture to a T. Near perfect silver, with just a hint of gold to offset the tone. 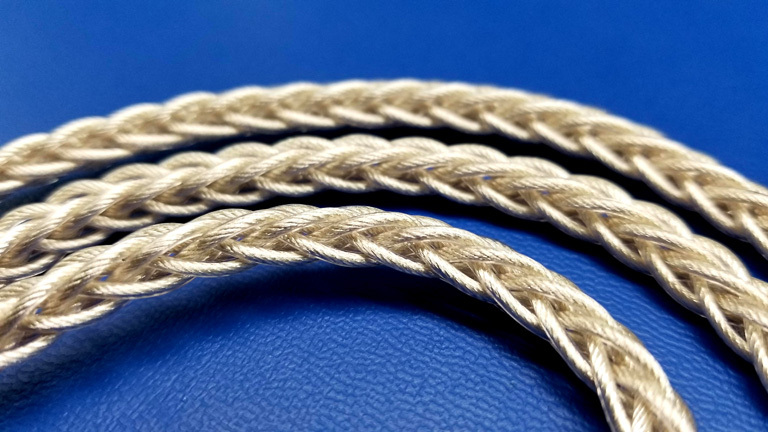 Seeing this lustrous metal wound up in a thick, 4-strand square braid is captivating. Along with the chrome y-split and copper chin slide, the product is unmistakably luxurious, equal measure jewelry and audio equipment. And what of those ergonomics? Perfection! The comfort rivals that of Effect Audio, and may even supersede it by a hair. It drapes over your ear, and does not spring or bounce. Using a lapel clip (which I always do), the X8 hangs and conforms to you, instead of fighting you every step of the way. If you set it up right, making sure there are no unnecessary twists, you can even forget you’re wearing it. That is an achievement for such a big, heavy cable. My sound impressions are based on a pairing with Legend X by Empire Ears and the iBasso DX200>AMP8 as source. The plusSound X8 Silver + Gold has a bold, powerful quality. Clarity and dynamics are off the charts. The vividness of vocals and instruments is awe-inspiring. They jump forward, becoming bigger and brighter. Bass notes feel enormous, rumbling like a volcano and erupting like an atom bomb. Treble is oh so airy. It extends up the frequency range with crystalline purity. Quickness of attack and heroic aggression means you’re unlikely to fall asleep with boredom. Resolution is at an all-time high, rendering sharp and precise, conveying all manner of textural richness. The soundstage is the largest I’ve heard, creating grand space and clean atmosphere around the elements. This is a cable which quite simply gives you more of everything. More clarity. More bass. More energy. Bigger stage. More… excitement. If you’re looking for a nice jump up over your stock cable, but don’t want to spend all the monies, this is a great choice. Comparing with the Effect Audio Thor II Bespoke 8-wire ($850, Review HERE), first thing I notice is that famed EA liquidity. There’s a smoothness which I’ve never found an equal to. The X8 comes off brighter and more energetic, while the Bespoke is warmer, richer, and more mature in character. The blackness of the background feels deeper on the Bespoke, yet X8 hits with greater dynamism. Vocals pop more on the X8, but feel more natural on Bespoke. 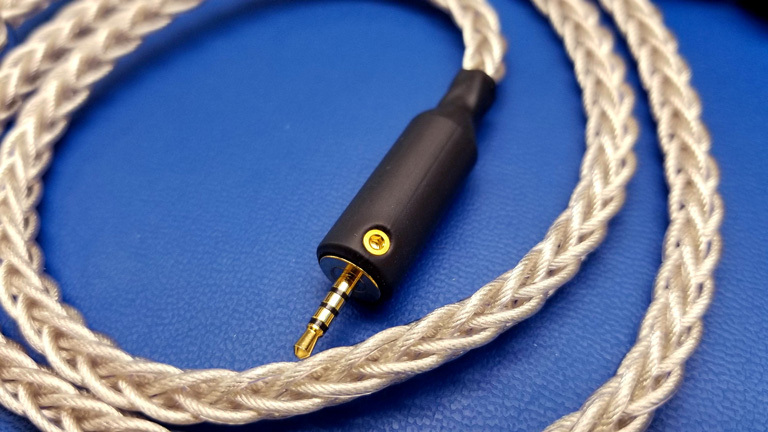 Soundstage is a definitive win for plusSound, pushing the width and height a tad further than any other cable I’ve tried. Thor II Bespoke, however, is nipping at its heels. 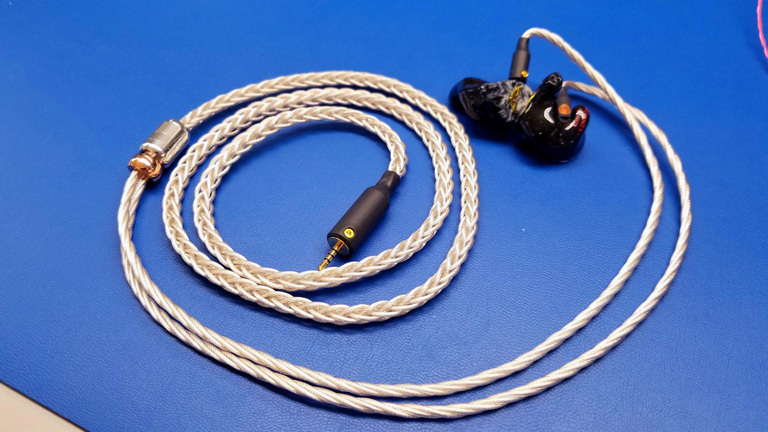 Now, the 4-wire, thicker gauge, Thor II Plus ($569.90, Review HERE) sits sort of between Bespoke and X8 in some aspects. Like X8, the bass feels heightened and more aggressive, striking with ferocity. On the other hand, the treble is just as tame as with any of the Thor line, so overall clarity and vividness haven’t changed. The X8 is still king on that front. With the heightened bass and tame treble, Thor II Plus is the warmest of the bunch. Vocals are large like X8, but rounder and lusher. Soundstage width is bigger on X8, but height is very, very close. Resolution and detail are slightly less defined than Bespoke, and fall even further behind X8. For pairing, be mindful of your tastes and how you wish to alter the sound of a monitor. If unleashing the full potential of your monitor and letting those highs soar scares you, opt for a warmer solution, like Thor II. But if you’re already using a warm IEM, and want to wake it up a bit, X8 Silver + Gold is a great choice. 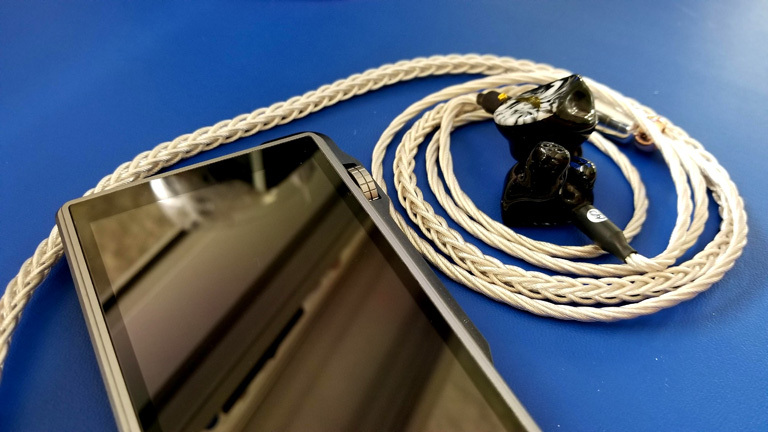 The Custom Art FIBAE Massdrop Exclusive, FIBAE Black, and the JOMO Audio Quatre are perfect examples of insanely warm and musical gear that always benefits from extra clarity and resolution. Legend X, also, which has more treble and resolution than all of those, pairs beautifully with X8. Noble Audio’s Kaiser Encore, however, gets a little too bight for my tastes. That’s an IEM I’m always trying to tame. This is not a cable that destroys the signature you love. It enhances it. Like I said, simply be aware of what you love, and what you don’t. If you don’t want everything enhanced, look elsewhere. plusSound made a wonderful thing in the X8 Silver + Gold. 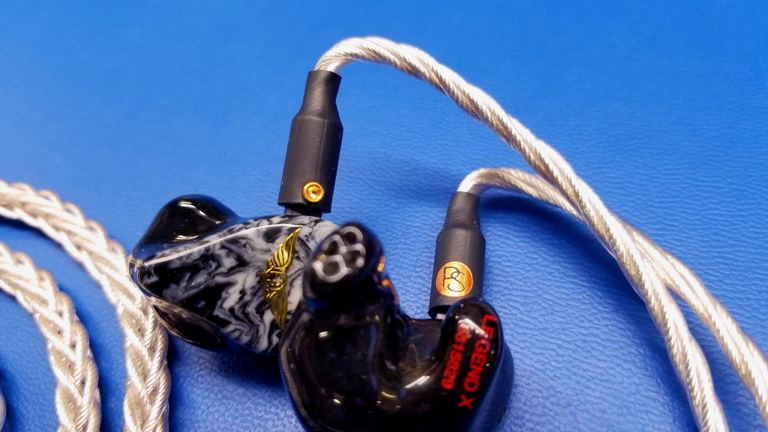 My favorite IEM, the Empire Ears Legend X, has never sounded more legendary. And that is a swell thing indeed.